The book in one sentence: From mediocrity to living out your dreams ... in the most of unlikely of places. 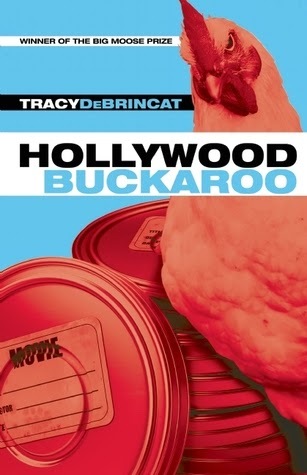 Synopsis of Hollywood Buckaroo by Tracy DeBrincat*: Hollywood Buckaroo tells the improbable and unintentional coming-of-age of Sander Sanderson, whose filmmaking aspirations are in the toilet after the death of his father, a successful plumber to the Hollywood stars. Dumped by his girlfriend, and unable to grieve for his dad or face running the family business, Sander wangles a shot to direct a hamburger commercial in the old west town of Buckaroo – thereby living his dream for one whole week before resigning himself to a life he dreads. As Sander struggles to rescue the imploding project, eccentric locals jumpstart his creativity and his heart, so he can mourn at last and begin to love. I was approached to review this book and found myself wondering about that red chicken on the blue cover. Neat-o ... and just a little strange, right? Then I read through the synopsis and decided ... what a surreal story. Then I had Tracy DeBrincat over to do a guest post, and she was the nicest ever! She reflects on why "you are not your hometown" which really got me thinking about me specifically (I'm a small town gal) and people in general (New Yorkers = all very chic and always in black?) Alright. I digress. Hollywood Buckaroo is funny, irreverent and rather over the top. Everything is larger than life, even a little weird ... kind of like being jetlagged and waking up in the middle of night with a raging headache and then deciding to watch TV at full volume and in fully saturated colour. Again I digress. Let's get back on track. The whole book is a nice digression from the ordinary. It's an unpredictable story that just kept me going because I didn't know what to expect, and even at some point I just dropped my expectations and just went with it. This book reminded me of the many Adam Sandler flicks I've watched (think Click, Spanglish, 50 First Dates), that while funny, even laugh out loud, gross funny, you know that while you're laughing that there's definitely a moral to it. Something that will make you think about life, your place in it, and what would make you happy. Really. That's what makes this book extra special. And that's why I think this would make great movie material. In the meantime, go get to know Sander Sanderson, the insane place of Buckaroo, and it's very special inhabitants. A wild ruckus of a book that has a surprisingly tender side to it. Highly recommended as a diversion, then to re-read to ruminate.